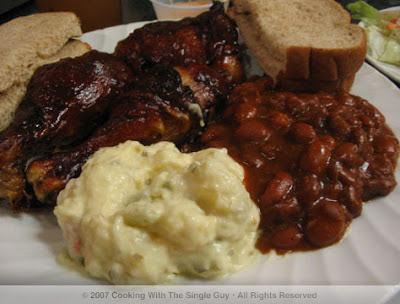 Probably one of the more popular recipes on this blog, and even among my friends when I talk to them about cooking, is this recipe for Sticky Chicken. It's a recipe I learned from my younger sister when I first started cooking years ago. And through the years, I've practiced the most difficult part, the caramelizing of the sauce to make it thick, goey, and sticky. This isn't a recipe that's quick to make, but it is definitely simple. Just a few ingredients, just a few easy steps, and in the end you'll have a dish your friends will oooh and aaah over at the dinner table. Plus get all sticky fingers from eating it. Enjoy! Dinner: Mon.Sat., 511 p.m.; late night dining: Fri.Sat., 11 p.m.1 a.m. The 3-year-old Roe Restaurant and Lounge closed earlier this year for renovations, and it reopened with a new chef who had just returned from three months of working at El Bulli the highly regarded Spanish restaurant of culinary maestro Ferran Adrià. With that background, I was as pumped to try out the new Roe as the pulsating dance music thats generated nightly by a DJ at the lounge upstairs. So when my friend Angel from Chicago came into town for a family wedding, we met at the Powell Street station on a Friday night and walked (with luggage in hand) a few blocks to Roe. The restaurant is situated near a strip of Howard Street thats like a mini club scene: The W Hotel is at the corner, Thirsty Bear is right next door and some kind of gentlemens club with an intimidating bouncer is across the street. We slipped into a booth near the sparsely decorated back area and ordered a couple of the specialty Asian-inspired drinks (think lychee, lemongrass and passion fruit) from the bar. Our waiter came and introduced himself and thus began our relationship for the night. I say relationship because the waiter, while professional and friendly, was extremely chatty about the food. Youd think as a food blogger Id appreciate that. 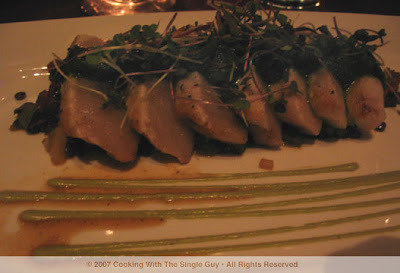 But on a Friday night after a few drinks, all I wanted to do was eat and not listen to the waiter go into every detail about the wonderful duck or amazingly popular hamachi. After the waiters presentation, the kitchen brought out a grounded duck meatball as an amuse bouche. It was nice, with a light soy glaze, but I always find it hard to eat a meatball in just one bite. The menu by chef Alvin San was split into first and second courses. 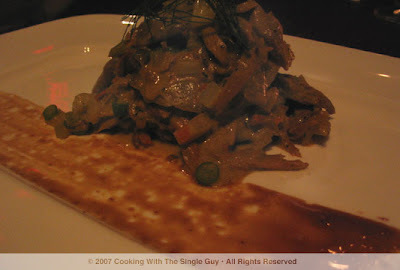 (The first courses ranged in price from $7 to $14 and second courses went for $17 to $25.) San supposedly revamped the menu to emphasize California cuisine with an Asian flair, but you could tell from some of the Mediterranean ingredients (i.e., couscous, Spanish chorizo) he injected into the dishes that he was influenced from his time in Spain. I initially had my eye on the Lollipop Scallops with prosciutto but passed when I found out the scallops were deep-fried. (Again, not a fan of fried foods.) 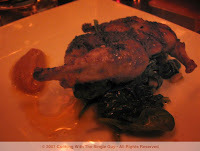 I also was tempted by the glazed duck breast because I always order duck when its on the menuunless its duck confit. This breast was prepared confit-style (braised in its own fat). 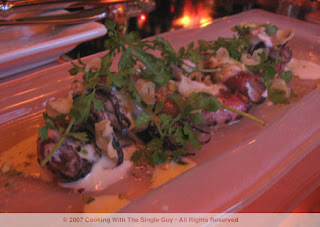 I settled on the seared rare hamachi ($14) as a starter and the Amsterdam lamb chop as my main course. Angel chose to start with the curry duck napoleon and the Tai Snapper for his main. When our dishes arrived, I thought we went back in time to the 90s when restaurants were serving dishes on super large plates and the food tucked off to the side. Both of our starters came in large white plates with the accompanying sauce painted on the bottom half of the plate. Angels curry duck was tender, but lacked any oomph IMHO. My hamachi came with an avocado cream and basil pesto, sat on French lentils and bits of Spanish chorizo and was topped with micro greens. I thought the hamachi was fresh and lightly seared, but didnt like the contrasting texture of the pillowy soft raw fish and the harsh lentils. Side note: With our dinner, Angel ordered a glass of Chardonnay that the waiter was pushing (he had offered tasting samples for both of us without us even asking) and I had a glass of Zinfandel from the California coast. Both were nice medium-body wine that didnt overpower our dinner. Our main courses arrived later, again on large white plates with the accompanying sauce creating a design on the bottom. (Is this the only thing Chef San picked up from his time at El Bulli? Plating?) Angels Tai Snapper (a white fish) had a nice golden brown crust to it and was perfectly moist. My lamb chops, cut French style like lollipops, was the highlight of dinner. I cant say I can remember any of the added flavors or accompaniments that came with my lamb (the menu said something about pomegranates and I'm pretty sure there were some fava beans). But I do rememberand probably will always rememberthe incredibly perfect execution of the meat by the chef. The lamb was tender but not rear. It was soft but not chewy. The meat kept its shape on the bone, but I didnt have any problems getting it off with each bite. There were just a few pieces of chops, and I literally picked up each one like a drumstick and ravaged every morsel of meat off the bone. And I rarely eat with my fingers! But I wantedno, I neededto get every bit of this lamb. While youd think I would sing more high praises on this lamb dish, I cant because the rest of the dish didnt seem to raise the well-executed meat to any new heights. The other ingredients were good on their own, but didnt seem to meld nicely with the perfect lamb meat. And that was the trend of our dinner, in my eyes. All the ingredients were top-notch and prepared expertly by the kitchen, but the vision behind the combination of these ingredients was a bit off. They neither sang together nor played off each other in a successful way. 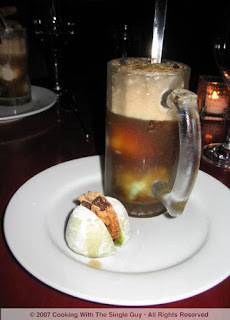 Each of us ended our meals by ordering the same desserta green tea and Coke ice cream float. After listening to our waiter briefly describe the ice cream as an inside-out sandwich (OK, I admit, I cut him off and told him the dessert sounded excellent without him fully explaining the last 5 minutes of his description), I had thought this might be where Chef San introduces some molecular gastronomy that he might have learned in Spain. Our dessert arrived and as we bit into the ice cream portion made with green tea and a gummy substance holding it all together with the cookie shell in the center, Angel and I looked at each other and said mochi ice cream. Thats right, it tasted simply like the craze a few years back of ice cream wrapped by the pounded and steamed sticky rice treat in Japan known as mochi. While it was good, it wasnt exactly innovative. The accompanying ice cream float was refreshing, but also failed to sparkle with new techniques. 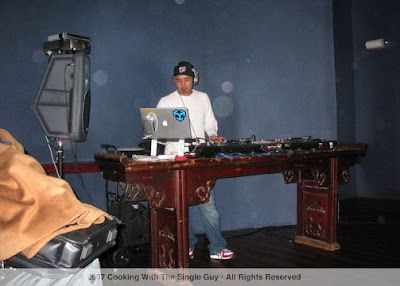 As we left, a DJ appeared downstairs ready to pump up the volume for late night diners while music was already going upstairs at the lounge (you have to go to the upstairs lounge and dance floor to use the restrooms). Maybe I had too many expectations of Chef San and the new Roe. Who knows, maybe with time the chef will experiment more and have more successes with the combination of flavors. 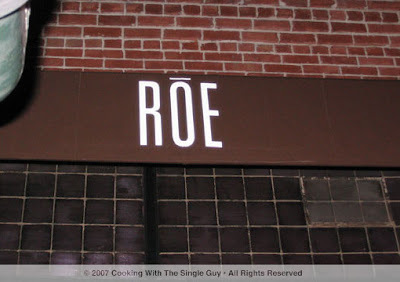 For now, Roe is a delightful restaurant with professional and welcoming service and a menu thats satisfyingly familiar. This past weekend I completed my quadfecta of bomboloni consumption when I finally tasted the last of the four flavors of this wonderful cream-filled Italian treat: Nutella. If you havent read any of my past raves about the bomboloni here or here, then the lesson is please keep checking my blog regularly. ;-) But really, for those who are just discovering my love of the bomboloni (and yes, it is true love), these plump and perfectly round doughnuts are made fresh with organic ingredients every day and then sold at Borianas Cornera quaint Italian specialty shop in the south end of the San Francisco Ferry Plaza building. Only four flavors are available: custard and raspberry ($2.50 each) and cioccolatto (chocolate) and Nutella ($2.75 each). I started with custard (always a favorite) and loved the creamy and slightly chilled egg-goodness at the heart of the sugar-coated bomboloni. The raspberry was less than successful, and reminded me of any jelly-filled doughnut at Dunkin Donuts. The chocolate was too rich and the filling not as creamy as the custard. So when I was at the Ferry Plaza on Saturday, I had little expectations for the final untested flavor, Nutella. To me, custard was the clear favorite. Oh. My. Gawd. Must. Go. Nutty. For Nutella. The Nutella was surprisingly creamy, almost gooey. It really could squirt out of the bomboloni as you bite into it. And how good is that? Each squirt gives the back of your mouth that instant pleasure of sweet cream and chocolate-richness that is Nutella, the Europeans alternative to peanut butter. 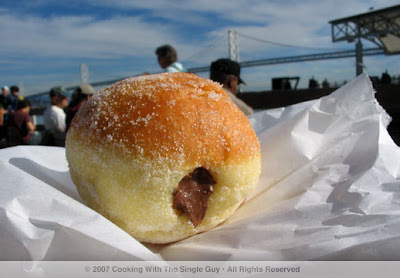 It was such a treat to enjoy the Nutella bomboloni, especially from my seat on the wooden benches with a view of the Bay Bridge on a sunny (albeit chilly) fall day. BTW, I still bought a custard and I am still amazed at how the custard bomboloni always seems to have more filling than all the other flavors (its like theyre giving away the custard, people!) and it always has that nice, slight chill to it. Having to decide whether I prefer the custard over the Nutella bomboloni is like how people always seem to want me to choose between San Francisco and New York. You just cant. Theyre both distinctive in their own ways, and theyre both loved for different reasons. Hmmm, if I could eat a bomboloni from San Francisco sitting in Central Park just behind the Metropolitan. Now thats an affair to remember. 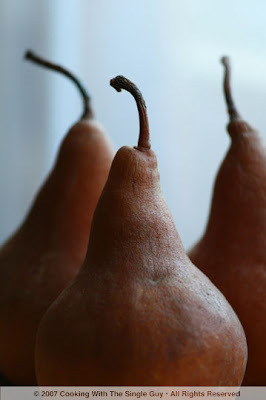 Earlier in the week, I saw these beautiful Bosc pears at the farmers market in downtown Berkeley. Pears are amazingly seductive fruits, just like figs. I guess it has to do with the shape, but I was especially enamored by the flowing stems stretching high. In this simple recipe, all you do is create a poaching liquid out of red wine and just cook your pears until tender. The poaching liquid has a real holiday taste to it because of the cinnamon and cloves. It’s almost like making mulled cider. You can create your own flavors with your favorite spices and then drop in the pears and in the end you have this wonderful and elegant dessert. Some recipes call for Bartlett pears, which I think are softer than Bosc so may not keep their shape as well. But go with your favorite variety of pears and then adjust the cooking time to the ripeness of the meat before you begin poaching. Enjoy! Peel pears but keep the stem intact. 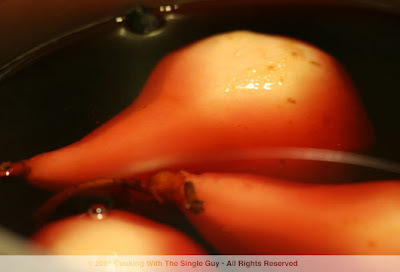 Drop the pears into a large saucepan filled with red wine, water, sugar, cinnamon sticks, cloves and Juniper berries. Add more wine and water if you need to fully cover the pears. Bring to a simmer over medium heat and cook until pears are fork tender, about 35 to 40 minutes (depending on the ripeness). You might want to stir the pears occasionally to make sure they cook evenly. You can store pears in the poaching liquid in the refrigerator until ready to serve. Put about half of the poaching liquid in a smaller saucepan (making sure you remove the cinnamon sticks and berries) and cook at medium heat for about 40 to 50 minutes to create a reduction that you can drizzle over the pears. In a small bowl, whisk together the marscapone cheese (at room temperature), sugar and heavy cream until smooth. Then scoop the filling into the pears with a small spoon or pipe in with a pastry bag filled with the cheese. Plate your marscapone-filled pears and drizzle with wine reduction. Serve immediately. Pair with a glass of Pinot Grigio. WHITE CREAM: I like pairing the pear with marscapone cheese because cheese is always a nice pair to pears. But if you don’t have marscapone cheese, you can simply serve it with some vanilla ice cream. 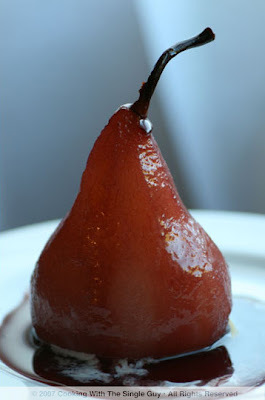 Keep in mind this will make your dessert sweeter when paired with your pears that were poached in wine and sugar. I was at the Ferry Plaza Farmers Market this morning in San Francisco and there was a long line outside The Gardener store. 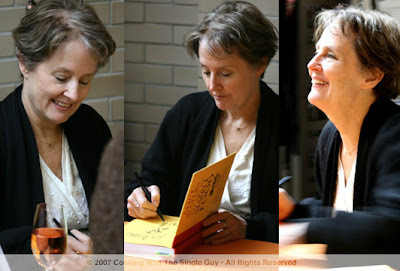 I thought they were giving away free samples of something, but when I checked out the front of the line, I saw the queen of sustainable food herself, Alice Waters. This Berkeley legend, traveling around the country peddling her latest book, The Art of Simple Food, is finally making the rounds closer to home. 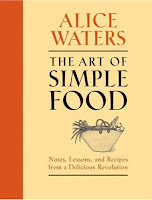 Her latest book focuses on simple standards that'll bring fresh, organic, seasonal dishes to your home. It's gotten mixed reviews for its approach (read the LA Times' review by Russ Parsons). Despite what people expected from the book, Waters is still the face of seasonal cooking. Alice, glad you're home where you belong. If you dont have a watchful eye, you might miss Ladys Place while strolling down Telegraph Avenue in Oakland. Thats because this modest Louisiana-inspired lunch spot is inside the Latham Square Building, off the lobby and down a few steps. 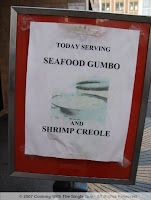 But luckily for me, I have eyes like a hawk and I spotted a sign for gumbo right outside the building. The lady of Ladys Place is Roslynn Lady DeCuir, who since 1989 has run a catering company featuring her Cajun-California specialties such as gumbo, fried chicken wings, po boys sandwiches and red velvet cake. I guess its called Cajun-California cuisine because like everything else in California, Ladys food is a mix of everythinga bit of Louisiana, some parts California with a bit of soul tossed in for good measure. 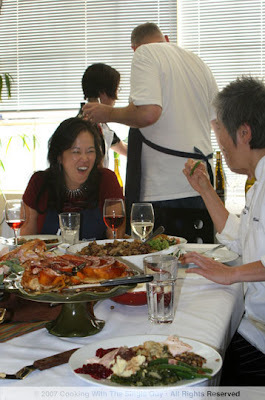 A few months ago, Lady opened up her place in downtown Oakland where fans of her cooking can now come in for lunch instead of just waiting for an invitation to one of her catered parties. Im always on the look out for lunch options near my office in what people are calling Uptown (the Broadway and Grand Avenue area), but I often find I have to go downtown for some real food. So I headed to Ladys Place, dreaming of a bowl of gumbo. 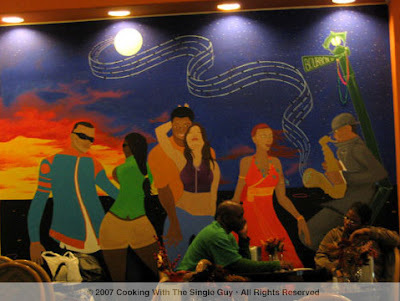 Ladys Place is a quiet, tiny eatery highlighted by a colorful mural showcasing the jazz heritage of New Orleans. You order your lunch at the counter and then they bring your food to your table. Gumbo is not on the every day menu. (Its only served on Friday.) But when I arrived on one Gumbo Friday, I saw people munching on bowls with these giant crab claws on top. Hmmm, a bit too messy for a quick lunch, I thought to myself. 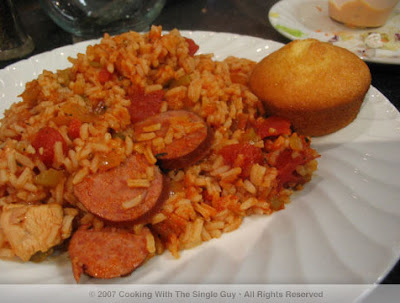 So after a quick scan of her menu, I settled for the jambalaya, made with chicken and smoked-turkey sausage ($8.50). When my plate of jambalaya finally arrived, it really did look like it was just scooped out of a pot and plopped on the plate. It was simple and very much like eating at your grandmas. Setting presentation aside, I dug into my jambalaya (which also came with cornbread and a side salad of chopped head lettuce). It was charmingly tasty with a mild-to-medium spiciness to it. I actually probably could have done with more spice. 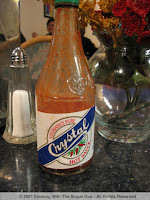 (Thats probably what the bottle of Louisianas Best Crystal hot sauce on the table was for.) Also, the jambalaya wasnt very complex. It was simply a mix of rice, chicken, sausage, and celery bits with seasoning and a bay leaf (which they forgot to remove before serving). When we arrived and ordered our lunches, I went ahead and got a plate of BBQ chicken ($8.50) because I dont eat a lot of beef and the ribs would be too messy. (Again, I had to go back to work.) Sue ended up not ordering the fried chicken because Ladys Place only offers chicken wings and Sue doesnt eat wings. (Too much work for the meat, she says.) So I convinced her to order the muffaleta sandwich. Sue had never heard of the muffaleta ($5.75), but I recalled seeing it on a Throwdown with Bobby Flay episode and I told her that it was a very New Orleans kind of sandwich. When our food arrived, Sue tried her muffaleta, which looked much smaller than what Bobby Flay made. 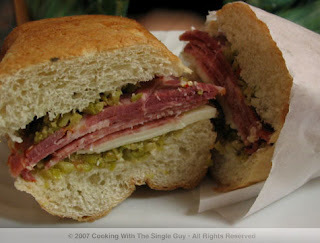 (A muffaleta is made up of layers of meats and cheeses that are accented by a vinegar-type dressing.) She didnt like the bread, which was a bit stale, and the sandwich overall tasted a bit dry. I felt bad that I convinced her to try it. Maybe she should have gone for a po-boy (another traditional New Orleans sandwich made of some kind of fried seafood or beef in a roll). My BBQ chicken was a large plate of tender goodness. Again, it looked like it was a plate my grandmother put together for me, but the chicken was tender and the BBQ sauce was a nice balance of sugar and vinegar. While I cant say it was the best BBQ in the Bay Area (it probably could have been better with a bit more smoke flavor), it was enjoyable. 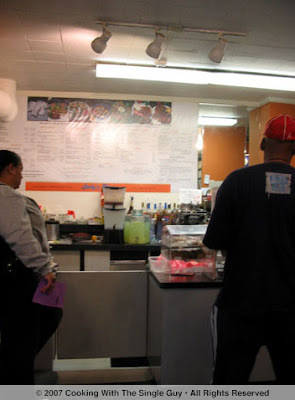 Side note: When I first visited Lady's Place, the smooth sounds of jazz could be heard in the eating area. But during this second visit with Sue, the restaurant's flat screen TV blasted a news program during lunch. Is this a sports bar or jazz place? I hope it's more the latter. Ladys Place is the kind of family-run, small business that you want to support. But the inconsistency in the dishes and the high prices (entrees run between $8.50 and $9.50) for a weekday lunch makes this spot an occasional visit instead of a regular must try. See how Im already thinking ahead for you! When Thanksgiving is over and you have all that turkey meat leftover, heres one idea for a simple meal the next night(s). 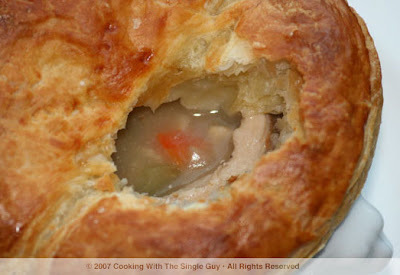 This turkey pot pie recipe is fun to do because it looks so comforting to see the puff pastry come out of the oven. So it definitely gets me in the eating mood. Plus, you can make the filling with almost any other leftover greens from your Thanksgiving dinner (except the cranberries, I would still just serve that as a side to your pot pie). This recipe is also useful all year round after youve made a roast chicken; just use the leftover meat to make a more traditional chicken pot pie. Enjoy! In a large saucepan, warm oil over medium high heat. Then add onions, carrot and celery and cook for about 3 to 5 minutes to soften. Then add mushrooms and cook for another 2 minutes (add some salt to season all the vegetables and to let the mushroom sweat out some moisture). 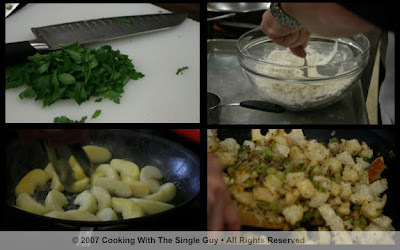 Add flour and blend in with all the vegetables and allow to cook off the flour taste. Then add white wine and let the alcohol cook off (about 2 minutes). Roll out your puff pastry sheet over wax paper with dusting of flour. 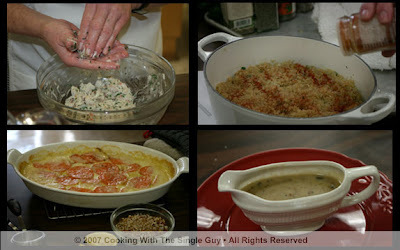 Get one of your terrines or footed soup bowls and place it upside down on top of the sheet and cut around the bowl leaving about an inch excess around the edges. Cut enough for all your terrines. 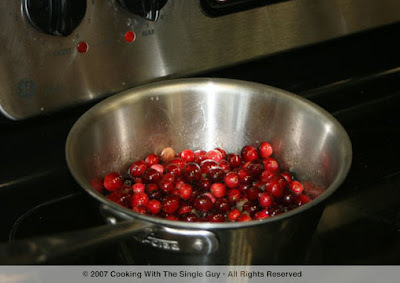 Ladle your turkey mixture into the terrines or footed soup bowls up to about a half-inch from the brim. 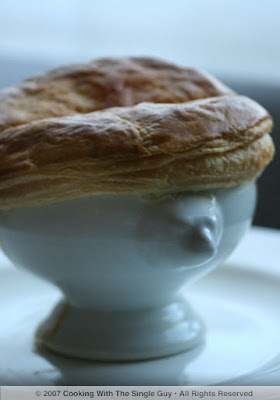 Stretch the puff pastry over the top and press the edges against the side of the bowl. Use a small knife to pierce a few slots in the center. In a small bowl, mix your egg with a bit of water to create an egg wash. Then with a pastry brush, lightly brush the egg wash over the pastry dough. Optional: Sprinkle a few sea salt on the top. Place on cookie sheet and bake in oven for about 30 to 40 minutes until puff pastry is golden brown. Remove from oven and allow to cool for about 15 minutes before serving. Makes three to four servings. Serve with a mixed green salad or other leftover greens from Thanksgiving. Pair with a glass of white wine (use the same wine you used to make the pot pie). TIP: You can substitute the fingerling potatoes with new potatoes or Yukon potatoes. I like the fingerling because they keep their shape better, but if you like your potatoes softer, then try another type. You can also fill your pot pie with whatever greens you have leftover from Thanksgiving dinner, such as Brussels sprouts or green beans. Just add them near the end to make sure theyre not overcooked. LEFTOVERS THAT KEEP ON GIVING: You can make the soup-base for this pot pie and then refrigerate it and just bake the amount you need for that night. For your puff pastry, just wrap it with parchment paper and place it in an air-tight container in the refrigerator. Roll it out when you need to cut the cover for your pot pie, and then crumble the rest into a ball to save for the next night. But when my culinary tastes broadened, so did my curiosity about cheese. It started with Parmigiano-Reggiano, then some smoked cheddar I stumbled upon at Whole Foods, then some Manchego at a friends dinner party. Eventually I was eating Cowgirl Creamerys Red Hawk, not offended by its musky smell and loving the buttery, rich texture. Now I love cheese so much that I thought itll be fun to talk to someone who loves it even more. So I picked up the phone and called Ray Bair, owner of Cheese Plus, a cozy neighborhood specialty store in San Franciscos Russian Hill thatlike its name saysstarted off focused on cheese but then broadened out to wine, meats and sandwiches. Bair spent years specializing in cheese for Whole Foods in California before opening Cheese Plus two-and-a-half years ago. And this guy knows his cheese. 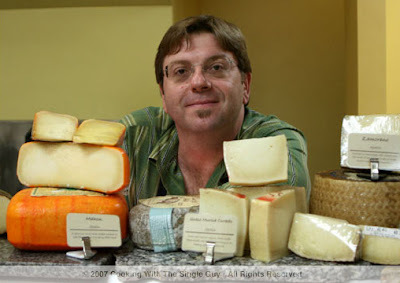 I visited with him recently at his store at the corner of Polk Street and Pacific Avenue to talk about the trends in the industry, his tips for buying and serving cheese, and any advice he might have for people like me who loves cheese but may be prone to high cholesterol. The following are edited excerpts from our conversation. Chef Ben: So how did you get interested in cheese? Ray Bair: There were essentially two things that happened. One must have been maybe 20 years ago or so I was cooking for Whole Foods, actually. I was very friendly with the people in the cheese and wine area of the store. Someone had called in sick and they asked me if I could come over and help that night. And I liked it. It was fun. I had been in the basement cooking, making trays of food. And being up on the sales floor and talking to customers, I hadnt done before. I thought that was very exciting. Couple of years later the opportunity to work at cheese happened. I started working full time and I thought I had a really good knowledge of what I was doing. But in 1992, Whole Foods transferred me to the Mill Valley location. So I had heard there was a cheese shop in Mill Valley and I thought Id go check it out and see what they were selling there. And it was an incredible experience. It smelled in there kind of like my store smells here. Its one thing you cant really get the same effect in a grocery store as you can in a cheese store. And I talked to the owner. The store was called Mill Valley Cheese Shop and the owners name was Forrest (both Forrest and the cheese shop are no longer around). I said, What is that smell? And he said, Oh, its this cheese called Livarot" and he pulled this little cheese off the shelfnot out of the cooler but off the shelf. And he showed it to me. Its this little brown box, 4 to 6 inches round. And he says they call this the colonel. And I said, Why do they call it the colonel? Because it has the stripes along the outside like how the colonel has the stripes on the uniform. So he gives me a taste of it and I was really afraid because I thought it stinks; Im not going to like this. I tasted it. He said first you have to sniff it. So it was like this whole food revelation that you would sniff your food before you tasted it. The whole thing was just mind-blowing, even though Id been working in the cheese world for a couple of years. So I said, How did you know what you know? And he said, Ive been doing this for awhile and you know, there are books out there. And I said, theres books on cheese? I was very much of the American mindset that cheese was dead. So it has no real value. Its just something you enjoy when you eat it and it fills you up. I didnt have any concept of history and geography, and all of these different things are what made me fall in love with the cheese industry. So it was that 15 minutes that I spent in Forrests shop that completely turned me upside down. CB: Do you still remember how that cheese tasted? RB: I still do remember how it tastes and we sell it in here now. Its not exactly the same experience because the laws have changed since then. The laws have changed on how its manufacturer, whether its made from raw milk or pasteurized milk. At that time, Im sure it was made with raw milk. Probably four to five years ago it was made with thermalized milk, which is the process of heating the milk below the standards of pasteurization. And nowadays its made with 100 percent pasteurized milk. So its lost some of its aroma and some of its character along the way. 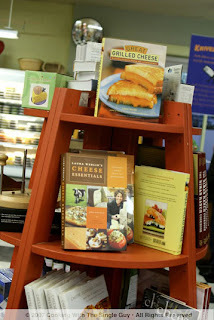 CB: So other than reading books on cheese, how else did you learn about cheese? RB: It was a lot of reading and a lot of tasting. At that time I joined the American Cheese Society and that was an incredible experience. 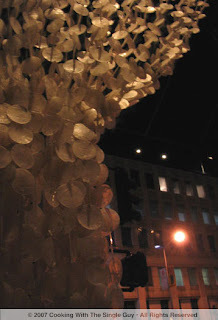 In 2006 I was an esthetic judge (at the societys conference) in Portland. We had 900 cheeses to be judged. This year, in Vermont, I didnt attend but they had 1,200 cheeses all made in the United States and a few Canadian cheese as well. When I started in 93, 94, I went to Burlington, Vermont the first year they had their conference there and there were maybe 50 people at the whole conference, we could all fit in one bus, I remember. And we didnt have 50 cheeses there to be judged. The whole industry, the mainstream culture changed about food in the 90s in a very positive way. People were coming back from Europe saying I had this particular product and I want it here, can you get it for me? Writers were talking about great cheeses made here in the United States. The economy was completely in our favor to buy European products at that time, not like today. The economy is the exact opposite now. Its unbelievable the exchange rate of the euro, which is the where the vast majority of all cheeses still come fromFrance, Spain and Italy. CB: In your store, whats the percentage of domestic versus imported cheese? RB: I would say its probably 85 percent imported and 15 percent domestic. We carry what I think is a nice selection of domestic cheese, especially domestic specialty cheese with the majority coming right here in California. 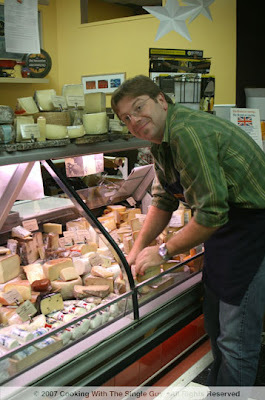 About 100 to 200 miles from this store weve got a handful of cheese makers who do a great job. People ask me all the time, well, should you sell more American cheeses because the European stuff is so expensive? But you know what? The American stuff is just as expensive if not more. CB: Is it because its mostly small producers in the United States? RB: Yes, its small producers who are just getting into the business buying land and buying the animals, buying the equipment. Its very expensive to do this kind of work in the United States. The production is small. The work the American cheese maker has to do to market their cheese versus a French cheese maker whose family or community or region has been making cheese for centuries is just unbelievable. 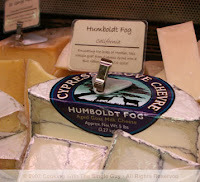 The branding, the amount of free product they have to giveaway at events just to make the Humboldt Farm, for example, be a household name much like double cream brie is in Franceits just completely different. The costs to get it to the marketplace are much higher. We dont subsidize the cheese making industry in the United States. And you get the small farm whos making 10 wheels or 15 wheels a day, which isnt that unheard of, and I can get a few wheels here and there. I have to get it shipped here somehow, and UPS has got to be the most expensive way to ship here. The economy of scale of having a container filled with brie shipped here across the water even though the distance is exponentially farther and logistically a lot more work to get the brie here from France, the American cheese just arent any less expensive. CB: In the Bay Area people are more aware of the word artisanal. How do you make sure the cheese providers youre dealing with are giving you the quality of cheese that your consumers expect? We go to trade shows like the American Cheese Society where you get a chance to meet the cheese maker and meet the owner of the farm. CB: What are some of the trends in cheese right now? RB: In the last few years theres a trend to have older cheese that are saltier, sharper in character, bigger bolder flavor. So the idea of cave-aged, which is a word that gets bantered around, which sometimes have real meaning. It means the cheese was aged in a real cavemeaning stone walls. Sometimes it just means a refrigerated walk-in underground. 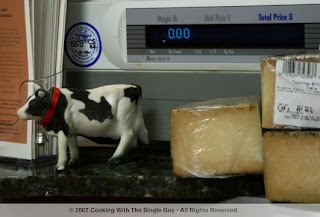 Its about aging the cheese, which is a process of drying the cheese so the salt comes out. And because the way of cheese making has changed over the years, cheese making is more hygienic now than its ever been. Theres been a huge wave of criticism and attacks toward eliminating or further reducing the amount of raw milk cheeses that are available. So fewer cheese makers are making raw milk cheese than 40 years ago. Theres very little of the indigenous culture, and the culture is the bacterial culture that gives cheese its flavor. So the cheese has become much cleaner in flavor. The downside of that is theyre bland. So how do you make a cheese have more strength? You have to let it age so the flavors will develop and to boost that salt because people love salt. They love the feel of it and they love the taste of it. The downside is you see the decline of not bland cheese because nobody wants to eat bland cheese. But you see the decline of subtle cheeses. Its harder to sell to a customer a cheese thats subtle and complexa cheese with great restraint. Theyll say, Oh, it doesnt hit me right away. I say, No, just be quiet. Just wait, 15 more seconds. And then they say, Oh, there it is. Its the same in the wine industry as well. The wine has to be highly alcoholic, rich and sweet right up front. The other trend youre seeing in cheese right now is the idea of buying locally. We had a couple in today from Ohio and they wanted to have all local cheeses. Thats also happening in the imports as well. People want those specific cheeses from the small farms more and more. RB: Theres a little bit of the competitiveness of food now. Oh, Ive had San Andreas for many years, give me something else. So theres that sort of new factor of wow me with something I cant get anywhere else. The other part is people are traveling more and theyre finding out about these specific cheeses from these specific towns. The distributors are getting more savvy and theyre out there looking for more cheese to bring to market. The world doesnt need any more Manchego. Theres enough Manchego in the world. Its a wonderful cheese, its great, but everyone has one now. So they need to find that other cheese from Spain. CB: Youve traveled around the world tasting cheese. Which country would you say makes the best? RB: Theres no doubt that France is the king, even though every country Ive been to has a great cheese. Stilton (a blue cheese from England), in my opinion, is a better cheese than gorgonzola, which is the predominant cheese in Italy. 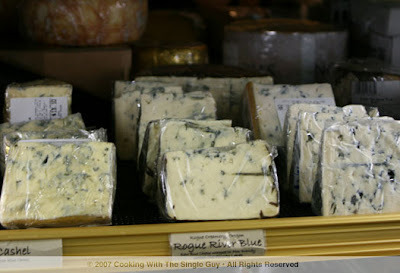 But I cant say its any better than Roquefort, which is just an incredible cheese. The culturenot the bacterial culturebut the culture of the community in France you cant compete across the board. Its just too powerful. Theres too much cheese and too much history in cheese making in that country to not give it top marks. CB: Do you think the American consumer has become more sophisticated when it comes to cheese, enough so to support the artisan cheese industry? RB: I think it has grown a lot. But coast-to-coast? No. Ive traveled around the country to know that we live in a wonderful place, the Bay Area, where food is a tremendous part of the positive culture here. ... You can go into any large cityChicago, Los Angeles, Dallas, New Yorkand youre going to find all the same kinds of things you have here. But when you get outside of those communities, its not happening. Its orange or white, and thats really it. You have Philly cream cheese and you either have orange or white cheese. And whats happening is even though consumption of cheese is at an all-time high in this country, its mostly fueled by pizza. So all that tonnage of mozzarella and cheddar is going into pizza. CB: Lets talk about some basic tips for cheese shopping. 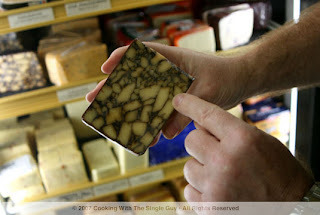 Is there a certain smell you want to look for when shopping for cheese? RB: Yes and no. There are certain smells which you dont want to have a lot of. Cheeses by nature when theyve been wrapped up, theres a lot of gas in that cheese that needs to come out and sometimes ammonia is one of those aromas. A little ammonia can be good. A lot of ammonia in all instances means no good. Sometimes its really just a judgment call. Some people might say, that cheese smells so rotten and so bad I just never can imagine eating it. And other people will go, it smells like mushrooms, and leather, and straw and cauliflower, and theyre all excited about all those aromas. So if it seems fowl to you, I would pull away for sure. The positive things youre looking for are those things: straw, grass. Maybe you want it to smell like yogurt, which is what we call lactic acid. So you want it to smell like fresh milk or yogurt. Toasted hazelnuts and almonds is a real predominant aroma you sometimes get, certainly in sheeps milk cheese and goats milk cheese. Sometimes you get strong, herbaceous notes of thyme, lemongrass, depending on the cheese. CB: Is it necessary for cheese to have a smell? RB: Its good to have a smell, but its kind of like fish. They say fish shouldnt smell, but fish always smells a bit like fish. The secret is if youre at the store, even if youre at our store here, when we take the cheese out from the refrigerator and give you a taste of it, its too cold. It needs a little while to warm up. If you leave it in your hand and fingers, itll warm up a little bit and starts to pick up that aroma. But if its overwhelmingly strong for you in the aroma, you may not like the flavor. The majority of what you taste is what you smell. But it is important to give it a smell first so you have an idea of what youre putting in your mouth. CB: Ive noticed some cheeses that have a strong, almost offensive odor. But then you taste it and its amazing. RB: Yeah, a lot of the wash-rind cheeses are like that. The wash-rind is a process of washing the exterior of the cheese with a solution, usually a salt water or herbs and alcohol. And it develops another bacteria culture on the cheese. And thats kind of like a little security guard. It stinks, its big and its brutish. But the interior of the cheese can be sweet and delicate. CB: After you buy the cheese, how should you store it? RB: The longer you want to keep it, the colder you want to keep it. But you dont ever want to freeze cheese. It just doesnt work. It does not thaw properly. So forget about freezing your cheese. But you want to keep it as cold as possible if you want it to live as long as possible. If youre going to eat it in a couple of days, if your house is cool enough, you dont even need to refrigerate it. Just leave it on the counter. You do need to think about the fact that its going to need to breathe. So you dont want to put it under a glass dome. Its going to get steamy; its going to cook. But most peoples refrigerator is just fine. If its not already wrapped in either parchment paper or wax paper, you want to unwrap it from any plastic wrap. The plastic wrap is sort of a necessary evil of the industry because people want to be able to see their cheese. And we want to be able to have a real air-tight seal on that cheese so that moisture doesnt develop and air pockets arent admitted because thats what makes the cheese start to spoil when theres moisture and air trapped inside of the plastic. So unwrap it and rewrap it in either wax paper or parchment paper and then you can either put that into a Zip lock bag or a Tupperware container or just wrap it again in plastic wrap. CB: How long can cheese last? RB: In the modern world, a lot of cheeses have been treated with an antimicrobial agent, which keeps the mold from growing on the outside of the cheese. And its not always real clear on the label what has or hasnt been treated. So some of these cheese Ive had Ive taken them home and theyre in the back of the refrigerator and a month later Im like, Oh my God, I cant believe its still there and its not molded. Usually theyre drier cheeses that are salty like parmesan that will last the longest. Moisture is the biggest killer of cheese. If its really a wet cheese, its going to spoil quickly. If its drier, itll last longer. But you should be able to have from any store you go to, you should be able to go home and enjoy your cheese in three to five days. The other thing thats important for the customers to know is that they may come into a shop like mine, any shop where they can actually speak to an employee, and have someone cut the cheese to the size that they need. So if you come in and see that theres a half a pound of cheese cut on the display you can always ask if you can have half of that. ... And the other side of it is now cheeses are $40 a pound, you simply cant buy half a pound of cheese any more. You need to buy just a couple of ounces at a time to make it affordable. CB: How should cheese be served? RB: Best thing I can say about serving is to get a big plate. Dont crowd the cheeses on the plate. Put it on your platter, cutting board, or whatever surface youre going to use. then take them out of their wrapper and put them on to there and maybe loosely cover with a little bit of tin foil to keep the air out and put some wax paper on top and let them sit at room temperature for 30 minutes to two hours. Thats when your house is going to smell, the aromas will come to life, the flavors are going to be nice. And I recommend that you have a couple of different utensils. Theres nothing worst than having a blue cheese and a goat cheese on the same platter and using the same knife for both. Whats happening is you cant taste the subtlety of each of the cheeses when theres blue cheese on your goat and goat on your blue. Again, dont crowd your cheeses. They need to be enjoyed singularly. Three cheeses is enough, five is fine. Its not a salad bar. For accompaniments, I say, keep it simple as well. You know, honey, maybe some orange marmalade, walnuts, a few slices of fresh fruit, youre done. CB: When you eat cheese, do you usually just eat it by itself? RB: I do, sometimes with a little bread, not as often with crackers. Bread I find to be a better palate cleanser. CB: Do you notice whether you like to eat more soft or hard cheeses? Whats your favorite cheese? RB: I like the more subtle cheeses. 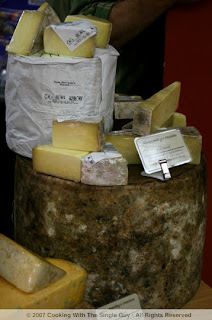 I like some of the sweeter styles of cheeses, a lot of those end up being milk cheeses. They have a more nutty character to them. Im a big fan of cheese like Taleggio and Epoisse. Taleggio is sweeter than Epoisse. Parmigiano-Reggiano is probably one of my all-time favorite cheeses to eat, for sure. But I like them all. English farm cheddar is the best. Its salty, grassy, has this wonderful flakiness to its texture. Its slightly musty and earthy in its complexity. So I like those cheeses. I love all kinds of goat cheeses. The goat cheeses typically have a high level of acidity so it wakes up your mouth and gets you salivating. CB: Earlier you said the trend on low-fat cheese has phased out. Do you have any tips for people who might be concerned about their cholesterol? RB: We encourage them to find a cheese that has the most amount of flavor that will satisfy that hunger for cheese. So you just dont eat as much. But cheese isnt the culprit. French fries and hamburgers are the culprit. And thats the thing people have to realize, if youre going to eat a piece of cheese, dont have a steak in the same meal. Just eat the cheese. Have the bread, fruits, olives, however you like to have it, but you cant eat salami and hamburger and sausages and eat cheese. Dont make cheese the bad guy. I know I definitely wont make cheese the bad guy. After our chat, Ray showed me around his store, including an entire refrigerated section of 25 different varieties of blue cheese. I also got to sample some cheese, including this incredibly subtle, creamy, grassy cheddar cheese from England. I always thought cheddar was so one dimensional, but not any more. Many thanks to Ray for taking the time out of his busy day preparing for the holiday rush to do this interview for my blog. If youd like to further your education in cheese, Id recommend you visit your local cheese store such as Cheese Plus where you can talk to the employees, ask for tastings and have them cut the cheese to the amount you need. Then take it home and smell it till your hearts content. 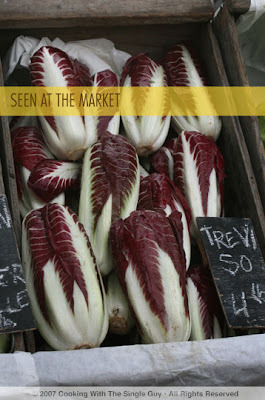 These radicchio at the Berkeley downtown farmers market had this incredible regal burgundy color to them. They were sold by this regular farmer at the market called La Tercera of Marin. They always have such a rustic presentation to their vegetables. They may not have a lot of stuff for sale (and they're kind of pricey), but they're always really high quality, such as the radicchio above. By the way, I love the full Italian reference to radicchio rosso. This is a video from the singer John Mayer's blog. I like his music, but doesn't he seem more an actor than singer? Well, on his blog he's started posting his lunches. (First Ellen, now John.) And then a few days ago he posted this hilarious video that features the Pinkberry frozen yogurt. As I mentioned on my earlier post about fro-yo, people are going crazy from the Pinkberry, as you can see with what happens to this singer. Dinner daily from 5:30–10:30 p.m.
Laiola’s overall casual feel fits in nicely with the Marina crowd. A handsome young man, dressed in a long-sleeve shirt (untucked) and jeans, stood outside the restaurant as I approached on Sunday evening. I thought he was just another curious diner checking out the menu. Turns out he’s the restaurant manager. And the rest of the team was just as casual, including my bartender dressed in a printed T-shirt and jeans. The neighborhood vibe of this Spanish-influenced restaurant and wine bar was what partners Joe Hargrave and Andrew McCormach were shooting for. But Laiola is more than a cool place to hang out with a nice glass of wine. 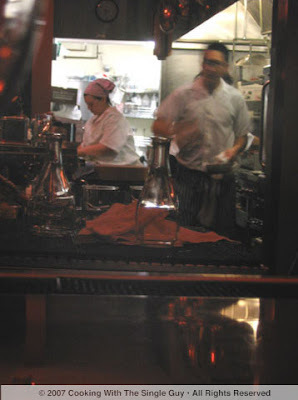 It’s also a great place to eat, with the clean and delicious plates coming out of the kitchen under chef Mark Denham. 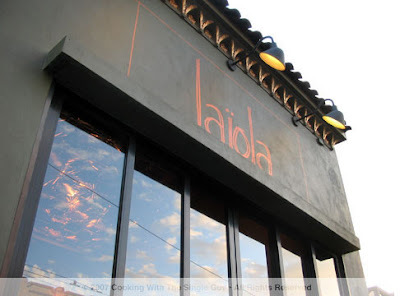 NOTE: Since Laiola opened earlier this year, it wouldn’t take reservations. 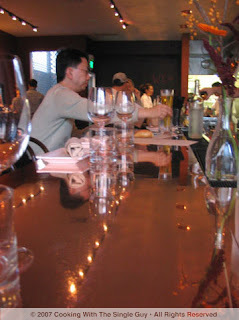 Its first-come-first-serve approach to dining was refreshing for a solo diner like myself, where I could find a seat along the long bar and watch the front row action of either the bartender or the line cooks near the kitchen. But just recently it instituted reservations (by phone after 1 p.m. or via OpenTable). This is probably good news for large parties not wanting to wait, but I feel like Laiola loses some of its small, neighborhood restaurant vibe with this step. We’ll see. 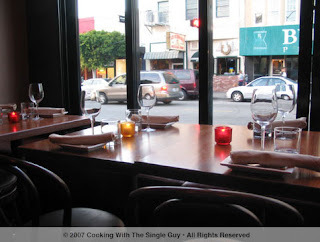 The small space of the restaurant has an open feel with its dark wood and big plate windows facing the street. While I was there, a few large parties snuggled in the side tables along the wall, but most people seemed willing to just pull up a stool at the long bar and check out what their neighbors were eating. Chef Denham’s menu definitely has a Spanish feel, with nods to fresh seafood and pork. It has a list of charcuterie items (oh, excuse me, I guess it’s called charcuteria in Spanish) and an even longer list of appetizers or tapas. There are also a few large entrée plates, but it’s a limited list. The tapa plates go for about $9 to $14 while the few entrées went for about $19 to $23. I started my evening with a glass of Spanish red wine called Mencia, which my bartender told me was similar in character to Pinot Noir. 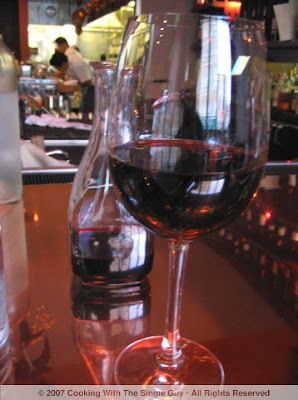 What I loved about the way Laiola serves its wine by the glass is that the bartender pours the wine from the bottle into an individual size decanter, which he leaves next to you. Then he pours the wine from the decanter into your glass. With the decanter, you can really get a glass and a half of wine, which is a good thing considering the wine cost $12 a glass. For my meal, I decided to forgo the entrées (although a neighbor’s slow-roasted suckling piglet looked wonderful) and got myself a mix of tapas. I started with Pears ala Plancha ($10) and local squid ($10). 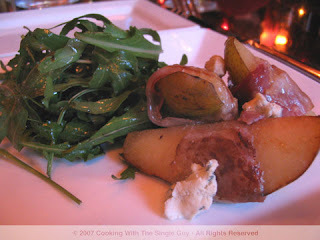 The pears were poached in wine and wrapped in jamón (the Spanish ham) and served with blue cheese and arugula. The pear slices were warm and tender, almost melting in your mouth with the salty jamón waking up your senses to really enjoy the flavors. They were complimented by the peppery-ness of the fresh arugula. Next up was the local squid, simply grilled and served with a lemon aioli. This was so perfectly symbolic of Spanish cuisine: clean, fresh food from the sea with the slightest hint of good olive oil. The squid was perfectly tender. I ate it so fast that I didn’t realize that I ate the mini parsley on top, which I now realize may have just been there as garnish. My third dish actually didn’t come up next. For some reason, the first two tapas came out in a timely fashion but I guess the crowd hit the kitchen as I dined because I waited and waited for my final dish, the Quaila la Parilla ($13) or roasted quail. It took so long that I felt the need to order another glass of Mencia (setting me back another $12). When the quail finally arrived, it was tender and tasty. But really, I don’t think I’ve ever had bad quail; it’s one of my favorite birds to eat. I ended the evening with an order of Crema Catalana, similar to crème brulee but with an orange-almond-cinnamon flavor. I don’t know if the pastry chefs had an off night, but it was such a spoiler end to the vibrant dishes that came before. The caramelized surface of the crema was badly burnt, so it offered up a bitter taste when I blended it with the custard. Despite the end, Laiola really did live up to its reputation has one of the hottest and lively new restaurants in town. And while tapas can add up because the portions are small and you end up ordering probably more than you should (in my case one wine glass too many), you’ll be rewarded by the freshness of the ingredients and the expert execution of the kitchen. Two Sundays ago, I woke up early, packed my camera and caught the BART train into San Francisco. I had a date with a turkey. OK, Ill stop here to answer your most obvious question. Why me? I sent in a 100-word e-mail essay a few weeks ago when I read about the competition in the Chronicles Food section. Then I got a call from Tara Duggan, a Chronicle Food writer and columnist and the captain of one of the teams. She asked me about Thanksgiving, how I learned to cook, my mothers maiden name? It was really all just a blur. 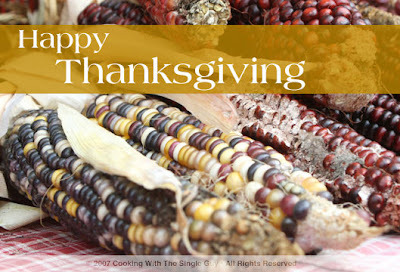 I remember saying I didnt have a special Thanksgiving recipe but I love how people come together to cook during this particular holiday. I also told her that I spent my weekends developing and testing recipes for my blog, so spending a Sunday cooking all day wouldnt be all that different. The following is a recap of the turkey cook-off. Warning: This is a pretty long post, probably even longer than my Next Iron Chef recaps. So kick up your feet, open a nice bottle of red wine, and let the battle begin! 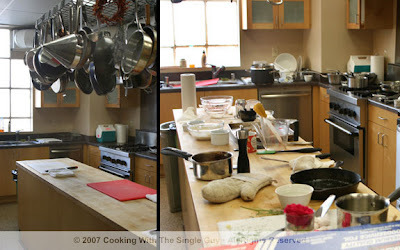 I had to include a before-and-after shot of the Chronicle test kitchen. As you can see, we actually didnt really make much of a mess. Of course, major kudos go to the two Chronicle interns who had dishwashing duty the whole day. They were so sweet and didnt complain whenever we would pile on the pots and utensils or bugged them about finding ingredients. The test kitchen is actually in a separate building away from the papers main newsroom at Fifth and Mission Streets in the city. 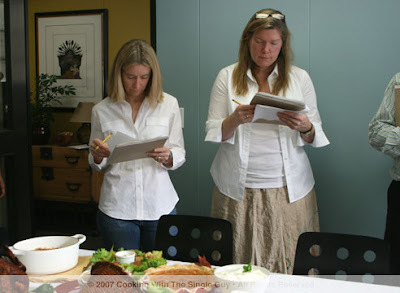 When not being messed up by eight readers, the kitchen is where the writers and contributors test the recipes that appear every Wednesday in the Food section. 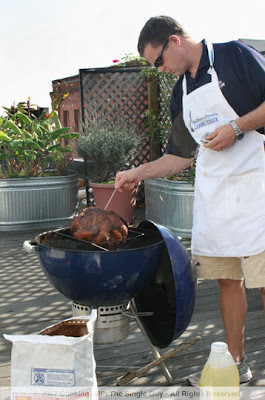 When we came down from the rooftop to start cooking, the Blue Team had already begun. And in a clear advantage, they took over the center work counter of the test kitchen, positioning themselves close to the ovens and sink. 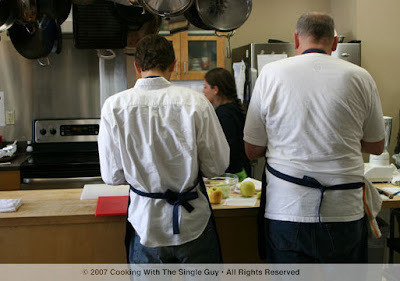 Above you see the backs of two Blue Team members, Jonathan and Douglas, prepping some ingredients. My team was relegated to a table off to the side of the kitchen. It was a challenge having both teams working in one kitchen. Just imagine Kitchen Stadium of Iron Chef America but without the rock concert lighting and smoke machine. 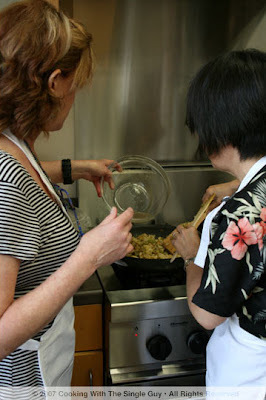 In the beginning, most people focused on preparing the sides and desserts. Above you see that the Blue Team is working on an apple dessert. I started by making my cranberry-pear marmalade, a recipe I developed based on a cranberry-mango chutney I typically make for Thanksgiving. I thought pears would be nice since theyre in season. After peeling and chopping a couple of Bartlett pears, I cooked them in a pan with sugar and vinegar to soften them and then I added the cranberries. I spent most of the morning watching the pot because the Chronicle test kitchen didnt have a reliable clock and I wasnt wearing a watch. So I had to watch my cranberries and just had to guess when they were ready based on when they reached the consistency I liked. When I tested the recipe at home, I cut the pears too big so they were chunky, so I cut them smaller during the actual cook off. But then it was too small because by the time the cranberries were done, much of the pears had dissolved. I actually like to taste bits of pears in the recipe, so if you end up making this, Id recommend cutting them as large quarter-inch chunks. Along with maneuvering around all the cooks in the kitchen, there was a photographer and videographer documenting our day. Here, the videographer interviews a member of the Blue Team, Lily (who has a cool user name of sticky rice), during a lull in the cooking. You can see the actual finished video here on the SFGate site. Lunch break. 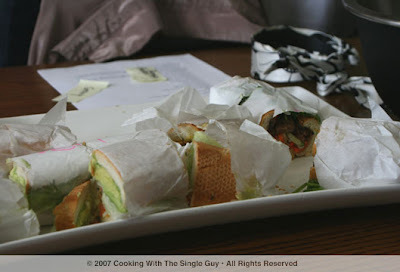 We took a break from cooking to lunch on some Vietnamese sandwiches and green salad that the Chronicle provided. At this point, both teams were pretty confident although I did hear that the Blue Team had to redo one of its desserts. Turns out, the White Team ended up redoing our dessert as well. This is why I dont bake. This was one of the most talked about recipe among the Chronicle staffers who had tested our recipes prior to the cook-off. 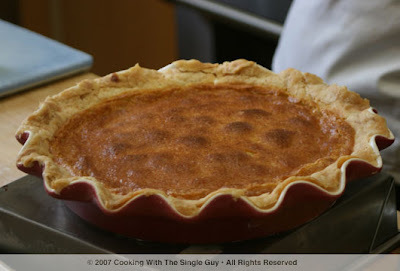 This is Markers wifes aunts recipe for Buttermilk Pie. Its just pure cream and rich. It looked beautiful, but it didnt set as firm by the time we served it. But really, that didnt matter because people with a sweet-tooth will basically be licking the filling off their plates when you make this. 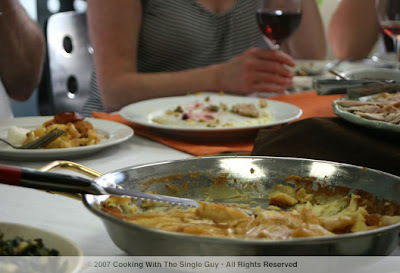 Once we finished cooking and plating our dishes, it was time for the foods close up. Above Craig takes a photo of the White Teams finished dishes. Thats Amanda Gold from the Chronicle staging the dishes. Shes the expert food stylist for the paper who was also helping out our team. We needed all her help because the other team, again in a clear advantage, took first swipe at choosing the serving dishes and much of the flowers from the rooftop garden for their presentation. Dang, they were fast. Maybe we should have had them meet outdoors in the sun. Heres the Blue Teams Thanksgiving meal. See what I mean about grabbing all the flowers for presentation? They clearly had the edge in looks. Heres a side by side comparison of the two teams vegetable dish. 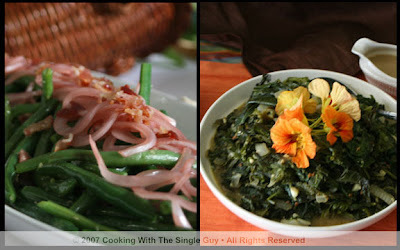 I worked on the green beans with pickled onions for our team on the left and Lily or sticky rice made this braised mixed greens with coconut milk for the Blue Team. The green beans were super easy to make, but I also experienced a last-minute delay. Tara had pan-fried the bacon earlier in the day and she wanted me to use the same pan to sauté the green beans right before serving so it could be warm and glistening from all the rendered bacon fat. (Altogether now: oooooh.) But someone had moved the pan off the stovetop during the mad rush of cooking and placed it in the sink for washing. When I dropped the minced garlic into a pan on the stovetop to warm up before cooking the beans, I realized I had dropped the garlic into the pan used to fry the crab cakes. So I had to ditch the garlic and start all over with a new pan. Luckily, Louse quickly minced some more garlic and I just loaded the pan with a lot of butter since I no longer had the bacon fat to work with. I think it turned out pretty nice after all. Here come the judges. Four people came in to judge our dishes. Pictured above are Emily Luchetti, left, pastry chef at Farallon, and Maria Helm Sinskey, chef at Robert Sinskey Winery. And that elbow on the far right belongs to Michael Bauer, who also judged along with Chronicle Food Editor Miriam Morgan (not pictured). After the judges were done looking at our presentations, the turkeys were taken back to the kitchen and carved up into plates made up for each judge. 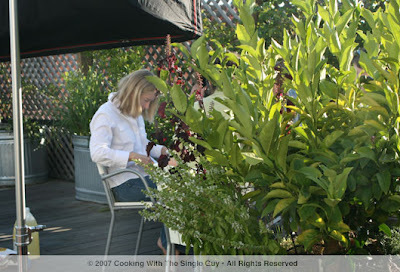 The judges went up to the rooftop garden to do their tasting and deliberating. Above you see Luchetti at the judges table with the other judges conveniently hidden behind that big bush. While the judging occurred up on the rooftop garden, the team members broke bread and ate the meal before us downstairs. It was a time for everyone to relax and enjoy the food, and there was so much of it! I tried almost everything and I have to say that everything tasted really good. Some things were more my favorite than others, but overall all the dishes were perfectly done and offered a lot of interesting tastes and flavors. In the end, the Blue Team had the better meal and was named the winner by the judges. They said something about how the Blue Teams dishes worked well together. But we all walked away with boxes filled with wine from the Chronicle (and two additional bottles of wine from Judge Sinskey). Despite the loss, it was a lot of fun meeting fellow food lovers. (Or what Louise calls "food crazies.") 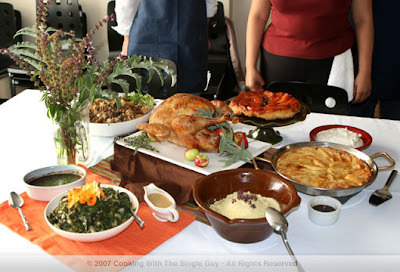 I dont have any major plans for Thanksgiving (because most of my family is in Hawaii), so in many ways sitting down with everyone over the big meal that Sunday afternoon was my Thanksgiving 2007. For the Chronicles story and recipes for all the dishes made by both teams, click here. 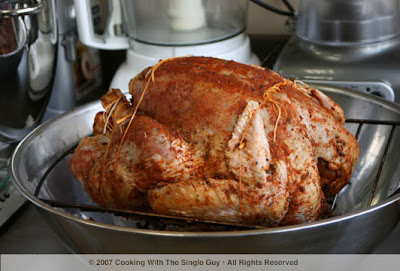 Turkey Cook-Off with Your Morning Coffee?